Can vegetarians stay in ketosis for a long time? Perhaps you thought the keto diet was all about eating a lot of meat. Well, the truth is more complex than that, so in this guide, you will learn how to be on a ketogenic diet without having to eat those healthy lean meats or fatty fish they always mention. You will see there is an even better way, and that is to get your healthy fats and nutrients from nature’s best. In this audiobook, other topics will be discussed, like the great advantages of avocados, what you should eat, what you should absolutely avoid, how you can utilize supplements to aid you in your determination and plans, and what causes those dreaded inflammations. In a brief chapter, we will also discuss how children can get the benefits from a keto diet their parents follow, and finally, the various dangers of sugar will be addressed, which will blow you away, figuratively speaking. This is your opportunity! Grab this audiobook and start listening now! To do so, add this audiobook to your cart. I loved the narrator, and I love the tips in this book that have really helped me understand the ketogenic diet better. It's so common nowadays to go on a diet like that, so it's not a surprise that books like these stand out. Thank you, narrator and author! This is a very good book. I was listening to it, and it made a lot of sense. Thanks for putting a vegetarian ketogenic diet book on the web. Especially in audiobook form, I loved this. I understand that this is a new keto diet book. As compared to all those other ones with all the glowing 5 star reviews, I gotta say that I liked this one the best. I mean, the voice was great, the information was to the point and straightforward, and Caitlin did a great job explaining why it works, what to eat, and what to avoid. You cannot ignore the fact that a lot of people have had success with these kinds of low-carb diets. And I like informative books like this that highlight those aspects and explain it well. 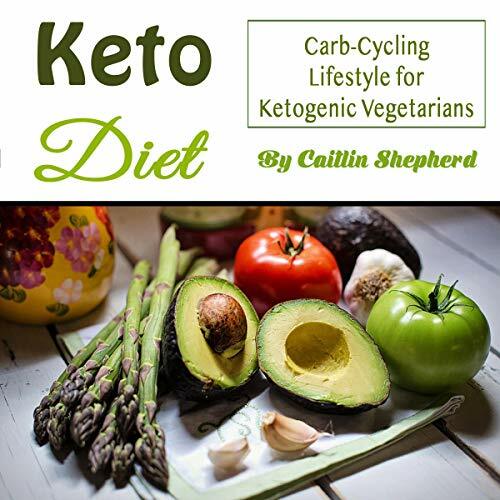 Although the vegetarian component wasn't specifically mentioned a lot, they left out all the talk about meat and animal proteins, which made me feel a lot better because it proved to me that you can be on a keto diet without having to eat meat. Great book. I picked this book up to see if it was something for me. I really liked it. It doesn't have any recipes, but then again, I don't want to listen to an audiobook with recipes anyway, so this was a great fit. The vegetarian elements in there were self-explanatory. Thanks.